Pinnacles National Park Staff and Rachel Wolstenholme (R), Condor Program Manager for the Californian National Park, unload a kenneled California Condor. 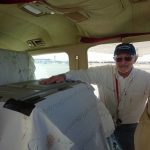 LightHawk Volunteer Pilot, Ralph Britton, flew the condor in his Cessna 182N from Boise to central California. Photo Credit: Ralph Britton, LightHawk Volunteer Pilot. California condors, with their nine and a half foot wingspans, have slowly returned to the skies after decades of dedicated recovery efforts. From just 22 individuals surviving in the 1980’s, there are now nearly 300 condors in the wild! 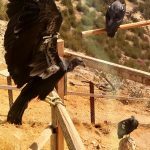 LightHawk, a nonprofit organization that accelerates conservation work through flight, has been supporting efforts to grow free-ranging condor populations since 2014. LightHawk’s conservation team works closely with partners to ensure that flights result in meaningful conservation outcomes. LightHawk’s conservation missions are flown by over 250 volunteer pilots that donate their talent, time, planes and fuel to help the planet. This past Sunday, seven LightHawk volunteer pilots helped bring nine California condors to their new home in the wild. Four of these pilots were flying Cessnas- 182N, 182S, 180 and a T210L. 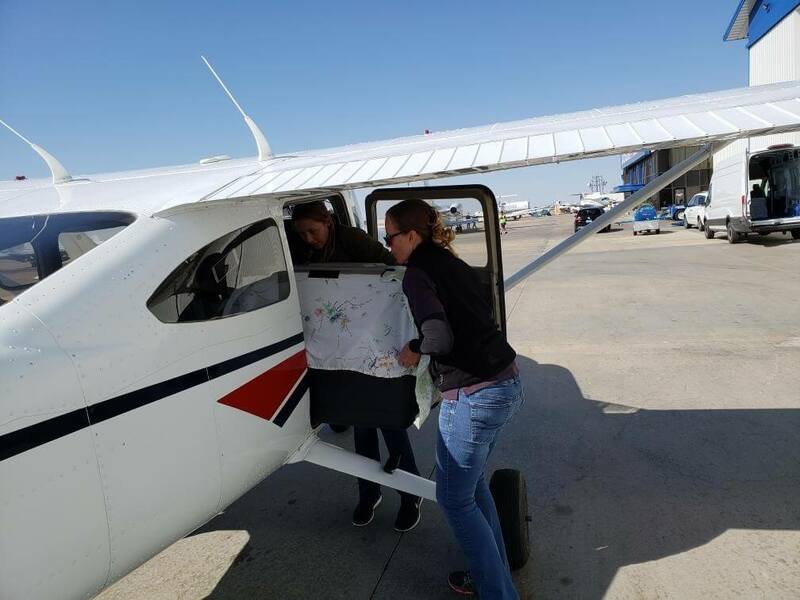 In partnership with The Peregrine Fund, Ventana Wildlife Society and Pinnacles National Park, the pilots flew juvenile condors raised at the World Center for Birds of Prey in Boise, ID all the way to central California. The birds have been carefully raised to ensure they do well in their new homes in the wild. 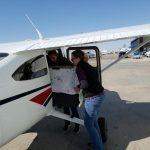 Following the delicate process of catching nine condors and putting them in large dog kennels, they were loaded into the volunteer’s planes (Daher TBM700B, Cirrus SR20 and SR22, and Cessna T210L, 182S, 182N and 180) on Sunday morning. “We are so grateful to the volunteer pilots at LightHawk, who donate their time and cost of fuel to help these endangered species,” noted Condor Propagation Manager of The Peregrine Fund, Marti Jenkins. 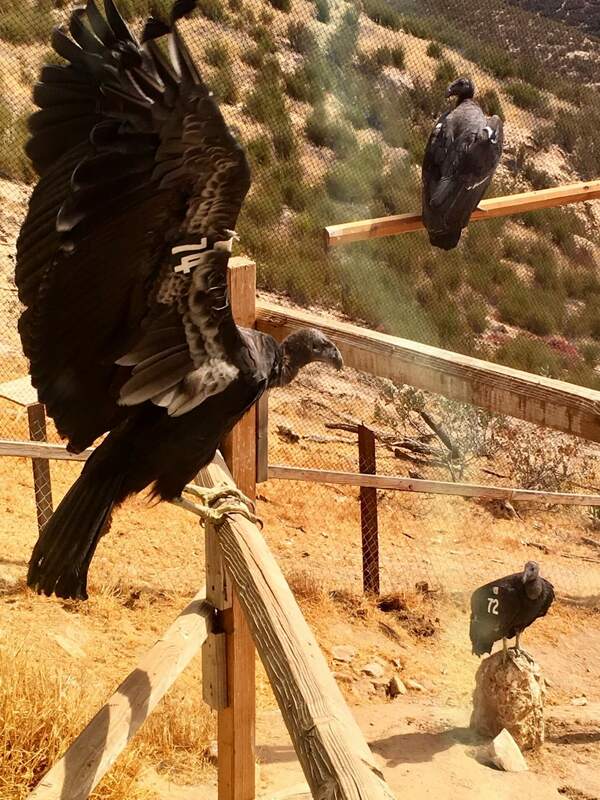 “This specially organized flight highlighted how LightHawk and the partners for condor conservation can work together to find great, efficient methods to enhance our work and support endangered species recovery in new and creative ways,” said Rachel Wolstenholme, Condor Program Manager for Pinnacles National Park. 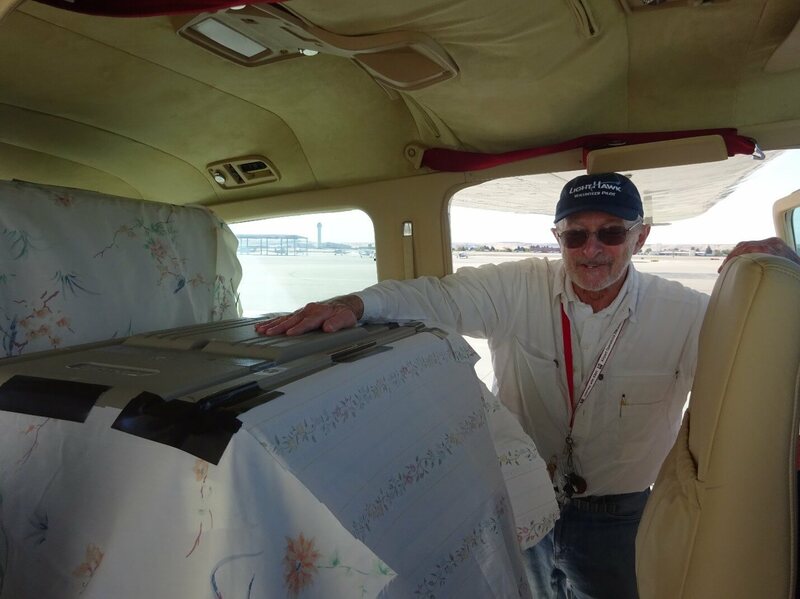 “The use of private aircraft made their transport much shorter and less stressful than if they had to be trucked,” explains LightHawk volunteer pilot and T210L owner, Daniel Marks. “To fit the two covered crates… I had to remove the co-pilot and two middle seats…I could sure smell them.” Ralph Britton transported his condor in a 182N. “My bird behaved well—not a peep heard from her or any mess. It was a slow flight with some headwind which reduced our ground speed and a strong mountain wave which affected our airspeed as well,” noted Britton, who has been flying for LightHawk over a decade. As you can imagine, a 20-pound bird that feeds on carrion doesn’t always have the best manners. Their scavenging diet is one reason California condors nearly went extinct and continue to struggle in the wild. Lead shot found in game animal remains are inadvertently ingested by the birds, which can cause lead poisoning symptoms and even death. There is a growing coalition of hunters that are choosing non-lead ammo, like high performance solid copper bullets, to prevent harm to condors, eagles, and many other scavenging wildlife species. In addition to transporting condors, LightHawk volunteer pilots help biologists track condors from the air, assisting the tracking they do from the ground. This is crucial for monitoring condor health and finding nesting sites. LightHawk staff are working to expand aerial conservation efforts to support California condor recovery sites elsewhere in Arizona, the Baja peninsula in Mexico and Northern California. LightHawk organizes flights across the US, Canada and Mexico, all to promote conservation. If you’re a pilot interested in volunteering for LightHawk, visit www.lighthawk.org. Juvenile California Condors are raised at the World Center for Birds of Prey in Boise, ID. These are a few of the condors transported by LightHawk volunteer pilots to central California, where they will be released into the wild and help the endangered species’ population thrive. Photo Credit: The Peregrine Fund. 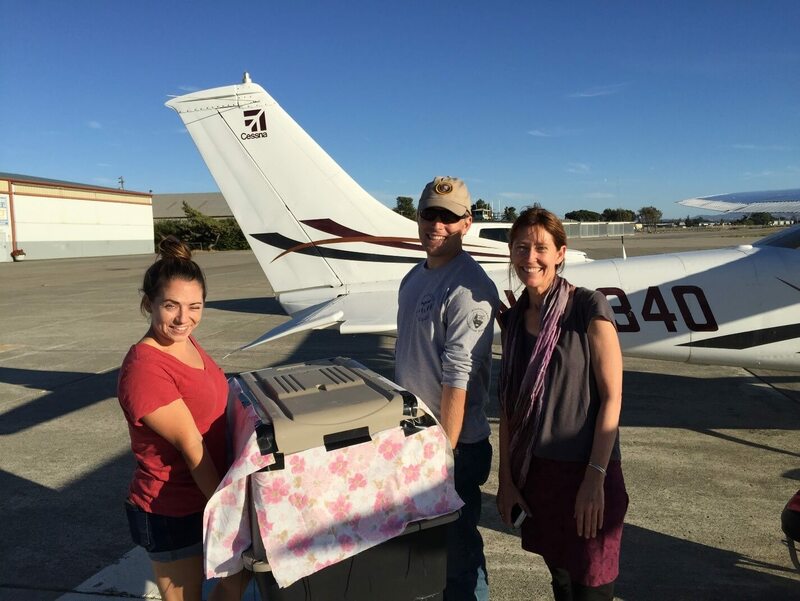 Peregrine Fund staff load a kenneled California Condor into LightHawk Volunteer Pilot, Lane Gormley’s Cessna 182S. The condor’s cage is covered to minimize contact with people and to keep them calm during transport. Photo Credit: Lane Gormley, LightHawk Volunteer Pilot. LightHawk Volunteer Pilot, Dan Marks, with two kenneled California Condors in his Cessna T210L. Marks needed to remove the co-pilot and two middle seats in order to fit his endangered species cargo. Photo Credit: Dan Marks, LightHawk Volunteer Pilot.